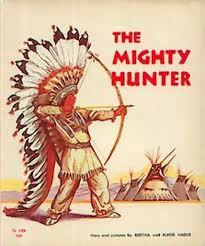 The Mighty Hunter by Berta and Elmer Hader has received harsh criticism for being overtly stereo-typical of Native American culture, but I found this book to be a delightful story using a little boy’s imagination to convince him of his need to go to school. Yes, the little boy is dressed in traditional Indian garb and hunting with a bow and arrow, but those were typical characteristics for children of his culture in the time period the book was intended to be taking place. I particularly enjoyed how the boy’s imagination runs wild as he starts by hunting a small rat and eventually finds himself facing a big bear with only his bow and arrow. 1. “Excellence of execution in the artistic technique employed.” The mixture of watercolor paintings and black and white pencil are amazingly detailed. The size scales and shading are superb! 2. “Excellence of pictorial interpretation of story, theme, or concept.” – The little boy dressed in traditional Native American clothes, along with the desert nature scenes, help this story come alive. 3. “Appropriateness of style of illustration to the story, theme or concept.” – While others may believe this book is stereo-typical, I think these illustrations are very close to what I have seen in photographs of how life really was for this culture. 4. “Delineation of plot, theme, characters, setting, mood or information through the pictures.” – Every picture helps the plot move toward the story’s climax. The characters are exceptional as the little boy is well-developed visually each animal is clearly increasing in size according to the storyline. 5. “Excellence of presentation in recognition of a child audience.” – My children loved this story and even asked me to read it again. I must say that this is one of my favorite Caldecott books thus far through this series. Dash and Dart, a 1943 Caldecott Honor Book by Mary and Conrad Buff, takes the reader on a year-long journey through the first year of life with two young deer. Throughout the book we are introduced to the mother doe, see the fawns taking their first steps, watch them learn about the dangers of the forest, and finally see them as grown deer. The book is broken up into chapters, but these do not seem consistent in length or topic. We did enjoy this book, but it could easily become tedious for younger audiences. 1. “Excellence of execution in the artistic technique employed.” While not the most impressive artwork, the illustrations are beautiful, brown pencil drawings. 2. “Excellence of pictorial interpretation of story, theme, or concept.” – The many pictures of deer and other forest animals help the reader visualize the words being read. 3. “Appropriateness of style of illustration to the story, theme or concept.” – The simple, thin pencil lines are very effective for this story. 4. “Delineation of plot, theme, characters, setting, mood or information through the pictures.” – The characters and some settings are evident through the illustrations, but the mood, especially, could be more visually clear. 5. “Excellence of presentation in recognition of a child audience.” – My 5-year old enjoyed this book, but my younger children quickly became bored. More color may have engaged their attention better. Have you ever found yourself with young children in a motel room with nothing to do but watch TV? How doyou keep your children entertained whilewaiting in a doctor’s office with only Ladies’Home Journal or Race Car Magazine to choose from? Sure, there are plenty of fun apps available on your phone to while away the time, but how about spending that time reading to your little one? We Give Books offers access to 227 children’s books that can be read online. Check http://www.wegivebooks.org/books to see the amazing free offerings you can access any time. The House At Pooh Corner continues the stories by A.A. Milne about the beloved Winnie the Pooh and his friends. In this book, the reader meets Tigger who takes the group on a number of exciting adventures and gets himself into several extraordinary situations. With each story, I become increasingly attached to Winnie the Pooh, loving his simple ways. I must admit that, while reading the final chapter titled “In Which Christopher Robin and Pooh Come to an Enchanted Place, and We Leave Them There,” I found my self becoming teary-eyed. As Christopher Robin explains to Pooh that he may not be around much anymore because he is “not going to do Nothing any more” and that when he does see him in future that things will probably not be the same, a poignantmoment is achieved as we are all faced with the reality of growing up. When I mentioned this to my husband, he grinned and asked me if I had been listening to the soundtrack of Toy Story II while reading this chapter. Yes, I can be a bit emotional, especially when it comes to realizing that this sweet time with my young children will be ever so short. Also, please read my review of Winnie-The-Pooh at https://littlebooksontheprairie.wordpress.com/wp-admin/post.php?post=372&action=edit. 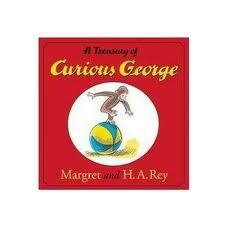 A few years ago my husband and I gave A Treasury of Curious George by Margaret and H.A. Rey to our oldest daughter for Christmas. The eight stories in this book are classic stories that we have read to all of our children over and over. My kids have also enjoyed looking at the pictures in this book on their own and retelling the stories to each other. If you are looking for a great book to give to a young child, A Treasury of Curious George is a sure bet! Also, see https://littlebooksontheprairie.wordpress.com/wp-admin/post.php?post=119&action=edit for more information about another great Curious George book! “Uh-Oh!” Said the Crow by Joanne Oppenheim takes a different spin on the typical barnyard story when the animals hear a loud sound. Each animal has a different response to what they are hearing that corresponds to their own sounds. In the end the animals find that apples from the tree by the barn are hitting the roof, and they are relieved that, instead of being afraid, they can now enjoy this tasty treat. Pros: A fun review of animal sounds that will also teach about onomatopoeia. This book may also help children with critical thinking as the animals figure out the source of the sound. Cons: It may be a bit difficult for younger children and those who do not read expressively to catch the onomatopoeias.